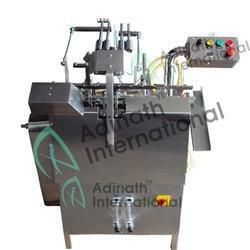 Leading supplier and manufacturer from Ahmadabad, our product range includes Ampoule Filling Machine such as single Head Ampoule Filling Machine, Two Head Ampoule Filling Machine, Four Head Ampoule Filling Machine, Six Head Ampoule Filling Machine, Eight Head Ampoule Filling Machine and Lab Scale Ampoule Filling Machine. Automatic Six Head Ampoule Filling Machine built on principle of slant travel of ampoules while filling and sealing, to take care of wide variation of Ampoule neck dimensions, thicknesses of available standard ampoules. The Filling unit built on Stainless Steel Square pipe frame and totally encompassed with Stainless Steel Coverings, in pleasing matt finish, Further, the large opening available at the bottom side for ease of absolute cleaning. The pendant type electrical control panel is lifted from machine for ease of operation and safety. The sterilized ampoule tray directly loaded in to slant hopper of the unit. The Synchronized star wheel delivers ampoules one by one on moving eccentric ampoule rack in six’s. During the stoppage of rack sequentially pre-gassing, filling, post gassing, pre heating and final sealing is achieved. Duly filled sealed ampoules then collected on collection tray automatically without hand touch. Double Stroke Ampoule Filling Sealing Machine is compact ampoule filling machine built on principle of slant travel of ampoules while filling and sealing, to take care of vide variation of ampoule neck dimensions & thicknesses of available standard ampoules. The Filling unit built on Stainless Steel Square pipe frame and totally encompassed with Stainless Steel coverings, in pleasing matt finish. Further, the large opening available at the bottom side for ease of absolute cleaning. All contact parts made from high quality Stainless Steel 316L & other Non-contact parts made from Stainless Steel 304. Minimum change over parts from 1ml to 10ml ampoule size. “No Ampoule – No Filling” system. Ampoule neck centering during gas flushing and filling operations. Possibility of nitrogen gas flushing before, during and after filling. Minimum change over time, little maintenance & easy cleaning. The sterilized ampoule tray directly loaded in to slant hopper of the unit. The Synchronized star wheel delivers ampoules, one by one on moving eccentric ampoule rack in single. During the stoppage of rack sequentially pre-gassing, filling, post gassing, pre heating and final sealing is achieved. Closed Ampoule Filling Machine built on principle of slant travel of ampoules while filling and sealing, to take care of wide variation of ampoule neck dimensions, thicknesses of available standard ampoules. The Filling unit built on Stainless Steel Square pipe frame and totally encompassed with Stainless Steel Coverings, in pleasing matte finish, Further, the large opening available at the bottom side for ease of absolute cleaning. The sterilized ampoule tray directly loaded in to slant hopper of the unit. The Synchronized star wheel delivers ampoules one by one on moving eccentric ampoule rack in four’s. During the stoppage of rack sequentially pre gassing, filling, post gassing, pre heating and final sealing is achieved. Duly filled sealed ampoules then collected on collection tray automatically without hand touch. High Speed Ampoule Filling Machine built on principle of slant travel of ampoules while filling and sealing, to take care of wide variation of ampoule neck dimensions, thicknesses of available standard ampoules. The sterilized ampoule tray directly loaded in to slant hopper of the unit. The Synchronized star wheel delivers ampoules one by one on moving eccentric ampoule rack in eight’s. During the stoppage of rack sequentially pre-gassing, filling, post gassing, pre heating and final sealing is achieved. Duly filled sealed ampoules then collected on collection tray automatically without hand touch. Single Stroke Ampoule Filling Sealing Machine is compact ampoule filling and sealing machine suitable to fill 1ml to 20ml glass ampoules. 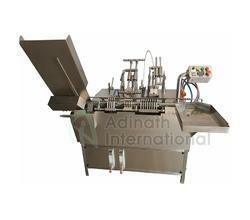 Machine is widely uses in pharmaceutical, cosmetic, veterinary and chemical industry. The Filling unit built on Stainless Steel Square pipe frame and totally encompassed with Stainless Steel coverings, in pleasing matt finish. Further, the large opening available at the bottom side for ease of absolute cleaning. The pendant type electrical control panel is lifted from machine for ease of operation and safety. 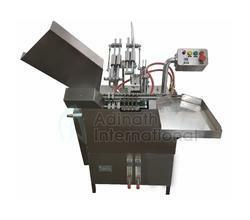 Onion Skin Ampoule Filling Machine for 1ml, 2ml, 3ml, 5ml, 10ml & 20ml is compact & versatile machine for the filling & sealing of glass ampoules. Ampoule Filling Sealing Machine uses in the pharmaceutical industry, apart from this Ampoule Filling Sealing Machine also having application in industries like biotech, cosmetic & chemicals. Empty washed & sterilized ampoules receive automatically on wire mesh conveyor belt from outfeed of sterilizing tunnel. Ampoule fed automatically into in-feed hopper from the left hand side of the machine and feed to receiving rack through cassette. The moving rack which moves horizontally collect four ampoules from the receiving rack and transfer the ampoule to the machine in left to right in an inclined position through pre-gassing. Pre-gassing, Filling, Post Gassing, Pre-heating & sealing station. Ampoule Filler is suitable for the filling & sealing of glass ampoules. Machine equipped with automatic ampoule feeding, filling and sealing station to complete the automatic filling & sealing of injectable glass ampoules. This Lab Scale Single Head Ampoule Filling & Sealing Machine is widely uses in small scale injectable organizations, R&D laboratory, Universities and other parenteral productions. Apart from the pharmaceutical this machine also uses in the cosmetic industry. Empty washed & sterilized ampoules fed into in-feed hopper from the left hand side of the machine to receiving rack. The moving rack which moves horizontally collect one ampoule from the receiving rack and transfer the ampoule to the machine in left to right in an inclined position through Pre-gassing. Pre-gassing, Filling, Post Gassing, Pre-heating & sealing stations completes filling & sealing operations. Filled & sealed ampoules are collected automatically in SS tray in upright position without hand touch. Glass Ampoule Filling Machine built on principle of slant travel of ampoules while filling and sealing, to take care of vide variation of ampoule neck dimensions, thicknesses of available standard ampoules. Being a reliable manufacturer, supplier and exporter, we are engrossed in offering Two Head Ampoule Filling and Sealing Machine. These machines are manufactured with the aid of modern machinery by making use of high-grade stainless steel that is obtained from authentic vendors of the industry. Moreover, we offer these machines in different models and specifications to suit the demands of customers. Contact Parts Made from Stainless Steel 316L. 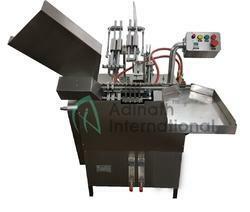 Ampoule Filling Machine is compact & versatile machine for the filling & sealing of glass ampoules. Ampoule Filling Sealing Machine uses in the pharmaceutical industry, apart from this Ampoule Filling Sealing Machine also having application in industries like biotech, cosmetic & chemicals. Power Supply 0.5 H.P. 1 H.P. 1 H.P.